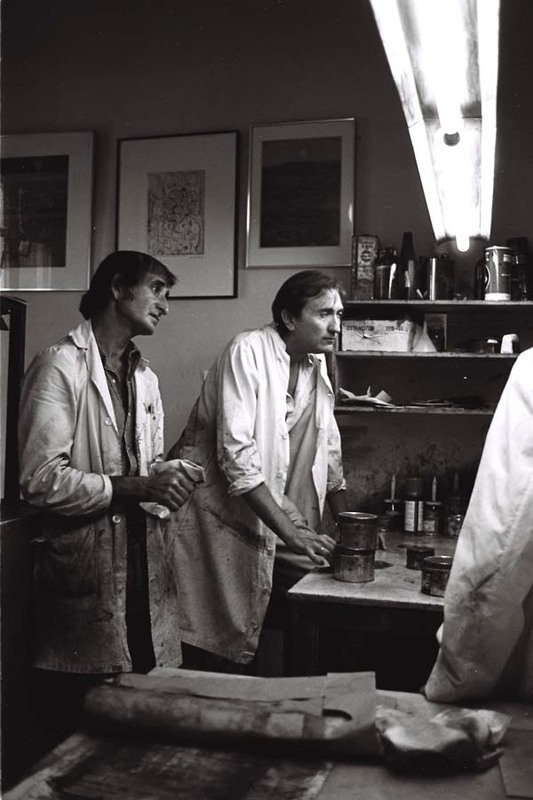 Then one day I bumped into my English painter friend, Louise Waugh, and she was over the moon because she had just been accepted to work at the Fundación Rodríguez-Acosta, the printmaking foundation created by Granada artist and philanthropist, Miguel Rodríguez-Acosta. “How did you manage that?” I asked her. “I just presented a portfolio of sketches.” The following week I showed up trembling at the door of the Foundation’s workshop with my portfolio under my arm. A couple of weeks later I received a note instructing me to show up at the taller on Monday morning ready to go to work. I couldn’t believe it. The heart and soul of the Foundation printmaking workshop was José García Lomas, the maestro grabador. Pepe had been formed as a master printmaker in workshops in Italy and in Barcelona and was a meticulous teacher, respectful of his students’ own styles and creativity, always conscientiously avoiding the imposition of his own. I worked under Pepe’s guidance for two and a half years, until the Foundation workshop closed. I thought I was there learning to etch. But now that I have my own workshop and work with artists I realize that my maestro was also, at the same time and by subtle example, teaching me to teach. For that I am eternally grateful. If Pepe thought you were serious he was lavishly generous with his printmaking knowledge. As I was usually the first one to arrive at the studio and was very keen, Pepe went out of his way to see to it that I was given a proper formation in etching. We would have breakfast together most mornings—café con leche and pastries– at the Sibarí bar on the corner. And when my husband Mike came to pick me up at midday we would all have a couple of wines together at the tapas bar halfway down the block. I was in my element; those were good times. There weren’t more than a dozen active artists at the Foundation and rarely did more than three or four of them show up at one time. 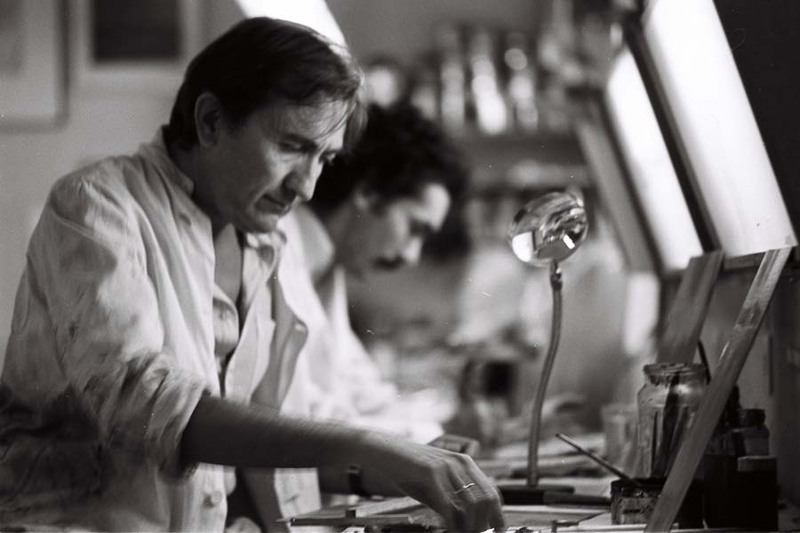 Many days I had the workshop, the maestro and his two assistants all to myself. I felt privileged, like an apprentice in a Renaissance etching studio, only better. I didn’t have to sweep up. Looking back I can conceive of no greater luxury. The norm at the workshop was three or four working proofs per plate. But if Pepe saw you were onto something he would let you keep on pulling proofs for as long as you needed. I say “pulling proofs,” but the truth is I never printed a single plate in all my time at the Foundation. That was always done by one or the other of the two studio assistants, Pepito and Ángel. My maestro was a meticulous artist and teacher and he made me meticulous. He was a stickler for the preparation of the plate, scrupulously polishing the surface and beveling the edges. Sometimes, even today, I’m shocked to see printmakers come into my studio with rough, ragged-edged plates, and I always think of Pepe.